Below are some thoughts on Louis A. Wehle’s c.1960 book, This was my Life. It was self-published and privately distributed as far as I can tell, but the title has made its way to some public registers, which is how I learned about it. A few copies are in booksellers’ hands and I bought one. Half the book is text, 180 pages, and the other half reproductions of old news articles, photos, and memorabilia of various kinds. One fine item is the menu for a southern, Florida dinner he gave at his “beachcomber” shack outside Palm Beach. The centrepiece of the book is the revival by Wehle of Genesee brewery in 1933. As he had worked there before Prohibition in key roles, but was in his prime in the 1930s, he offers a fascinating perspective on the full span of (pre-craft) 20th century brewery operations. 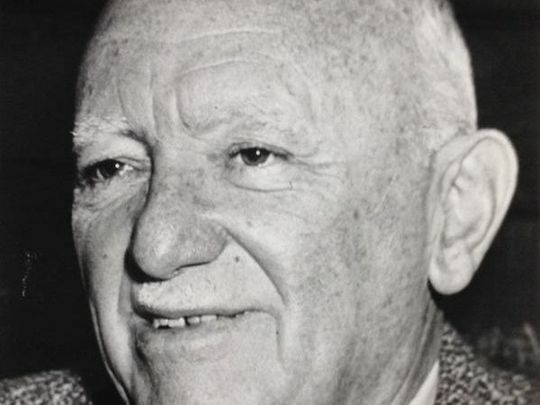 Wehle was born in 1889 and died at 75 in 1964. He was from a thoroughly German-American family, and one fairly prosperous. His grandfather had made good owning a sausage-factory. His father was superintendent at Bartholomay, a sizeable brewery in Rochester. The family was frugal despite enjoying middle-class prosperity, habits learned by Louis. He was always money-conscious. He credits his background with his outlook on life but is mildly critical too of his ethnicity, stating it had a tendency to emotional reticence and intolerance of different ways. While marked by his background, he was essentially American in character, e.g., he only spoke and understood bits and bobs of German. Louis was a striver from the beginning. As a young person he always worked at odd jobs, such as soda jerk, to earn spending money as the parents paid no allowance. He was boisterous at times, engaging in pranks as some youth will, but once reached 16 was determined to make his way in the world. With a high school education, decent for the time, and following a brief stint working in a law office, he went to Bartholomay to work in various office roles. At 20, on the suggestion of Bartholomay management, he qualified as a brewmaster by completing a course in New York City at the National Brewers Academy. It was associated with the Wallerstein brewing scientists, of whom I’ve written earlier. This distinguished him from many others who became brewers first and business managers later. He became assistant brewmaster at Bartholomay, and then brewmaster at Genesee and Lang Brewery in Buffalo, between 1911 and 1918. So he had years of experience both in the brewhouse and brewery management before Prohibition started in mid-1919. He explains that this background was invaluable to resurrect Genesee in 1933. During Prohibition, he first worked in chain grocery and bakery ventures in Buffalo, NY, then for his own successful bakery in Rochester. He sold the latter in 1929 – six months before the crash – for $1.3M, a lot of money in the Depression. When organizing the Rochester bakery years earlier he became skilled at raising capital. He was a large shareholder and retained control but other shareholders had bought in, who made money with Wehle on the sale. Some later joined him for the Genesee financing. He bought the brewery site in 1929 simply on a calculated guess that Repeal would occur within a reasonable window. Of course it did. The organization of New Genesee, as he calls it in distinction to pre-Prohibition Old Genesee, was a complex task. First, the raising of money again and he stretched his own finances to the breaking point. Second, sourcing equipment for the refurbishment (while brewing was still prohibited); it was all used, from existing idle breweries, except for a new refrigeration plant bought in New York. He hired many former staff of Old Genesee, from its last brewmaster, who only finally retired in the 1950s, to sales managers, maintenance, and technical people. Even though 13 years had passed, many were still available to come back to Genesee. It is often said that the brewing landscape before and after Prohibition were quite different. What struck me reading this book is the continuity, in this instance. Wehle believed strongly in advertising and engaged experts to plan his campaigns. As he states, no matter how good one’s product is, it must be brought to the public’s attention continually in new ways. Now, as to beer, many readers will think, as I did, what did he say? Very little! There is almost nothing in the book on beer as such with one major exception. This is his attempt to bring Burton pale ale to America from 1935-1938, which I discussed in previous blogposts but before having read the book. I may discuss this aspect in a future post as statements in the book add considerably to the picture. Apart from that, almost nothing except for the statement that in Rochester before Prohibition, 95% of all sales was draft; the rest bottled. He does not address what Bartholomay and Genesee made before 1920, or Genesee’s products from 1933 on. No discussion of ale vs. lager. No discussion of any differences in beer after Prohibition vs. before, or on cereal adjunct, hop varieties, or rates of hopping. He simply states that Genesee made “good beer” and once its trucks trundled into Rochester post-Repeal, every drop was sold instantly. The brewery was successful from the beginning and remained so during Wehle’s lifetime. By 1960, his son John was helmsman (Wehle descendants finally sold the business, to management, in 1999). I should add that with one of his brothers, Louis ran a small distillery during WW II, to supply ethanol to the government for munitions. Wehle visited Britain and Germany, as well as other parts of Europe, in the 1930s. He disliked German militarism and states he was glad to leave Nazi Germany to come home. He does not advert to Hitler’s persecutions, but I’d think he felt this was not within the scope of the book. As an example of his focus on the dollar, he recounts a story that is telling in retrospect. At Simpson’s-on-the-Strand, the iconic London restaurant, he enjoyed its famous roast beef. He asked for a second helping as the house was known to offer it without additional charge. On being presented with the bill, an extra two shillings was added! When he protested, he was told a 100-year-policy not to charge extra had been changed the day before. He still remembered this, a man wealthy beyond most peoples’ dreams, 25 years later. Wehle comes across as highly intelligent, driven, and perceptive of human nature. He had a sense of public duty and community spirit that now sound old-fashioned. He later became a New York civil servant in charge of conservation (mid-1950s), and led charities and other civic endeavours of value. A Democrat in politics, he supported civil rights and fair employment practices. While Catholic, he married a Protestant, Elizabeth (aka Libbie) Raab, of Scots-Irish and German descent. I mention these ethnicities only because he does and he stresses what he felt were largely positive values they imparted: The need to work hard, to provide for oneself and dependants, to save, to learn, to contribute back to society. One statement that resonated with me is his description of the community as something developed with sacrifice and struggle by past generations, on which everyone’s success depends. He explains that to improve and sustain the community each must contribute in his turn and not take the inheritance for granted. Another thing he states is, many people are capable of success but don’t achieve it for various reasons including being perfectionist. He states one must often take a chance in business even though not all information is known, even at the risk of failing. He mentions, although in no great detail, investments he made that were not successful. He states that self-confidence is essential in business, and various skills, but that one needn’t be the smartest person to succeed. Two investments that failed were in magazine-publishing, an interesting potential business for an avowed non-intellectual, a “pusher” as he called himself. It’s all good common sense, that he displayed in abundance. For hobbies he fished and hunted, including at a camp in Quebec. He also raised prize-winning livestock and poultry on a large farm outside Rochester. There have always been people like Wehle. The semi-conductor and software industries were and are full of them, as of course early and modern brewing and other industries. The type itself doesn’t really change, but society as he describes it has changed, I think. It is hard to say how he would view our modern society; I don’t think he would be died-in-the-wool conservative but many aspects of modern life would be hard for him to appreciate, I think, especially the altered view of families and the role of working women. The only disappointment I had reading the book is the absence of a “beer” chapter. He states he had to decide what to include and what to leave out. I think he felt this was a technical area not likely of interest to family and friends, the main intended reading audience again. All told though, the book portrays a surpassingly successful and interesting business executive and American. N.B. Of the many photos in the book, only one shows Louis Wehle holding a glass of beer. It is a full pint of ale at the bar of the Cheshire Cheese pub, Fleet Street, London.